When and where was the American Revolution fought and won? When and where did the Revolutionary War actually start? What caused the professional British Army to break and run from colonial farmers and shopkeepers? Who fired the first shots of the Revolutionary War? 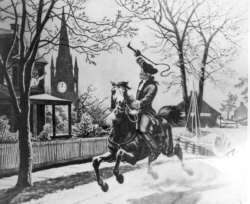 What did Paul Revere really say as he made his midnight ride? Come hear the story of the birthday of our nation. It will not be the story you think you know, or the story you heard in school. It will be the real story, the story that historians have discovered, the story of the first day of the American Revolution. Who fired the famous “Shot Heard Round the World”? Historians have debated this for years, but you’ll find out the real answer at a LibertySeed. Why did it take “three strikes of the match” before the American Revolution began? Yes, you believe the Revolution started on Lexington Green, when Capt John Parker’s men were shot down by the redcoats - but surprisingly, it did not began there. Nor did it begin with the fighting at the North Bridge in Concord a few hours later. You’ll learn the name of the obscure place the revolution REALLY began. Why were some local peasants (as they were viewed by the British army) able to break the British line at Concord’s North Bridge - in less than two minutes? Some original historical research suggests why, and the answer, unlike the answer to most historical questions, is one word. What was that one word? You will be surprised by how much is known of that first day of the American Revolution, a day that some believe is the most important day in American history. You’ll be surprised at how little you know of that first day, the most important date in American history. You’ll be surprised to find how relevant that first day is to your life today, and that some of the stories of that day, stories you never heard, are unexpectedly inspiring, unexpectedly rouse an echo in your heart. Maybe historians are right. Maybe history can be important. Maybe your heritage can be worth knowing.